The March 1931 issue of The Country Gentleman magazine included this advertisement for Timken bearings. 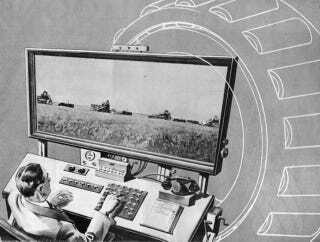 With the bold headline "100 YEARS AHEAD" the ad promises that the farmer of the future may be unrecognizable — thanks to Timken bearings, of course. Our farmer of tomorrow wears a suit to work and sits at a desk that looks oddly familiar to those of us here in the year 2012. We've looked at many different visions of early television, but this flat panel widescreen display really stands out as exceptionally visionary. Rather than toil in the field himself, the farmer of the future uses television (something more akin to CCTV than broadcast TV) and remote controls to direct his farm equipment. Television technology wasn't yet a practical reality in 1931, even though inventors had been making a go of it since 1880. But this high-tech vision of the future is even more astounding when you consider that when this advertisement ran the vast majority of farms didn't even have electricity. In 1930, just 10.4 percent of the 6 million farms in the U.S. had electricity. The ad tries not to position America's agricultural advancements as merely things to come. This being Great Depression era advertising — where messages of reassurance are common — the ad copy makes sure to explain that American farmers are more technologically advanced than those of any other country in the world. But, of course, Timken bearings are the economical way to catapult you into a bold new agricultural future. With science making such astonishing progress in all of its advanced branches, the above pictorial prediction may not be so far afield of the manner in which farming operations will actually be conducted 100 years hence... Operation of farm implements by means of television and remote electrical controls may then be more than merely an imaginary illustration... But even today, measured in terms of human progress, the American farmer is at least 100 years ahead of the rest of the world... In no other country under the sun will you find anywhere near 5,000,000 automobiles helping the farmer to a bigger and better life as you do in America... Over $2,500,000,000.00 worth of farm machinery — and radio valued at millions of dollars, are but a few of other factors that make American farm life profitable and pleasurable...Timken has both a direct and indirect bearing on practically everything you use or enjoy. For in the making of almost every important article, Timken Bearings play their part in keeping down costs... Your automobile, your telephone, your radios, your farm machinery are in countless cases fabricated with Timken Bearing equipped machinery... And after being economically manufactured with the aid of Timken, much of your power equipment, and an overwhelming majority of your automobiles and trucks have Timken Bearings. This is done so that your equipment will last longer — give more satisfactory service... Among the most important mechanical contributions of the last century are Timken Tapered Roller Bearings... With this advanced product all types of machinery enjoy friction freedom, which to you, the user, means longer life, lessened upkeep and reduced costs. If you would favor your pocketbook see that every piece of farm machinery that you purchase is Timken Bearing Equipped... The Timken Roller Bearing Company, Canton, Ohio.